While you're still chomping on chocolate Easter Rabbits, here's a "heads up" about Peter Rabbit. This July 28 will be the sesquicentennial anniversary (150 years) of the birth of Helen Beatrix Potter in 1866. No, I didn't know her first name was Helen until I went looking for more information on the English illustrator, natural scientist, conservationist, and author of the beloved Peter and other characters from her many books. I discovered this while talking with western Michigan storyteller, Deborah Schakel. She's been portraying Beatrix Potter for more than 20 years. 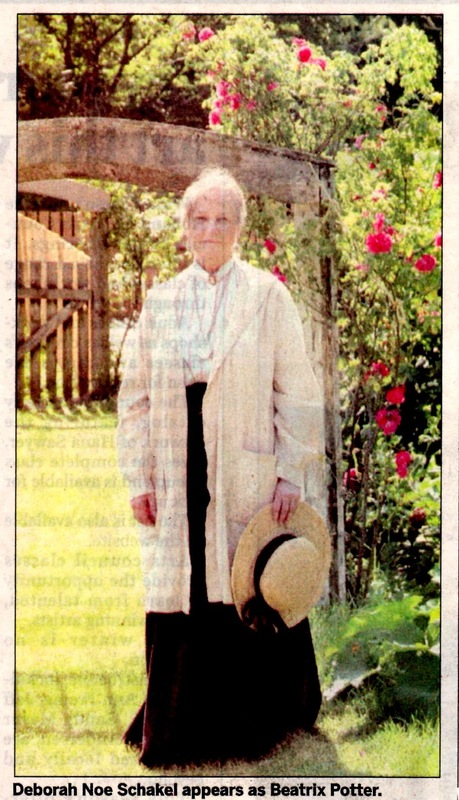 Here's a picture of her as Potter from an article last year in the Holland Sentinel. 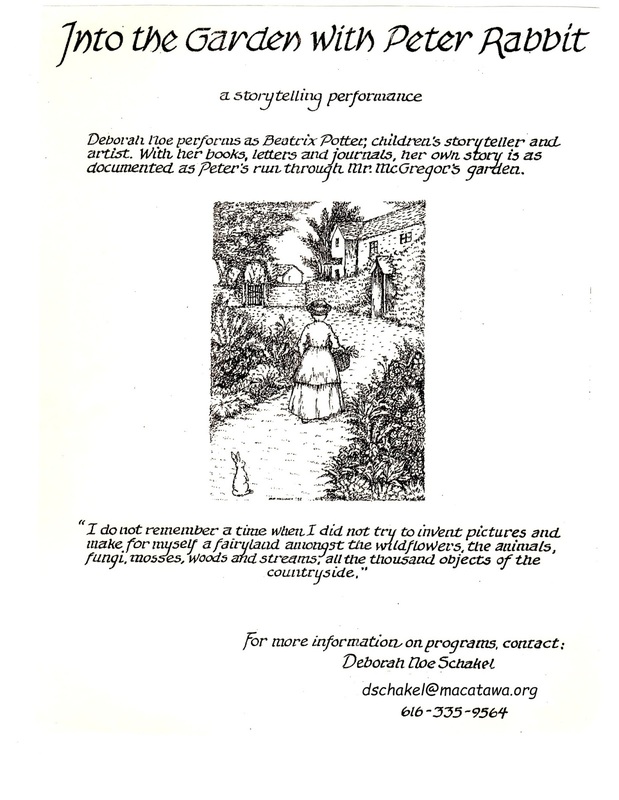 Schakel's program presents Potter's life, including how she came to write and draw about Peter Rabbit and his friends. By the program's conclusion audiences learn not only about the beloved tale, but how Potter saved a great deal of the natural landscape for England's Historical Trust. She combines all of this with telling The Tale of Peter Rabbit and showing reproduction drawings and books by the historic author-illustrator. Already anniversary programs are being booked with Holland, Michigan's Herrick Library scheduling her for July 30 at 2 p.m. I know this blog is often read by various locations seeking programs, so I want to also include her charming promotional flier. If you want to feel as if you've fallen down the Rabbit Hole (a reference to yet another literary rabbit, this one by Lewis Carrol) just put in either Beatrix Potter or Peter Rabbit in your favorite search engine and you can also do this in the YouTube search box. Not only will you find biographies of Potter, countless videos, and images, but there's enough products to guarantee supplying more children's nurseries and parties than Mr. McGregor could grow vegetables in his garden. Potter herself started the merchandising by making a soft doll and board game, with Peter being the oldest licensed character dating back to 1903. Potter was quite close to her editor and publisher, Norman Warne, even briefly engaged to him despite her parents objecting. Norman Warne was the youngest of the three brothers forming Frederick Warne and Company's publishing, but he died from leukemia shortly after their engagement. The publisher received her copyrights, which in Great Britain expired 70 years after her death in 1943. Most are also Public Domain here in the U.S. as they were written before 1923. Frederick Warne and Company, however, still owns the trademark rights to her characters, so merchandising profits go to them. In another bit of merchandising, I always love that Potter insisted her books be small to fit "small hands." When you put Beatrix Potter in your search engine, be sure to click on The Beatrix Potter Society as it's definitely the official site for anyone Pottering About. Oh, that reminds me, be sure to click on their Publications tab as Pottering About is the name of their e-newsletter, open to all for subscription. It tends to start with possibly uninteresting information with the best material near the end. Above it on the Publications tab are shown the official Journal and Newsletter contents of recent publications received only by members. The Contacts tab also holds a Links page. Write to someone you love. I love a little book showing her doing exactly that. Prowling Amazon I found Judy Taylor, who collected Letters to Children, has another book, Beatrix Potter's Letters that seems to be further letters. Taylor states at the time of writing this book she had 1400 letters, selecting 400 and the collection continues to grow as a "fascinating, but never-ending task". 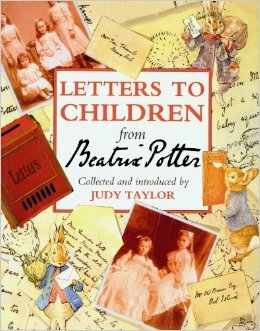 There's also Beatrix Potter's Journal, which was originally written in a code cracked by Leslie Linder over 20 years after Potter's death. The diaries had over 200,000 words from which Glen Cavaliero selected for the publication. Deborah and I both believe in telling about something we love, are eager to tell it to our audiences, which we also love, and we do the best we can. This blog is a way of sharing that love and I hope you either subscribe or come here often.